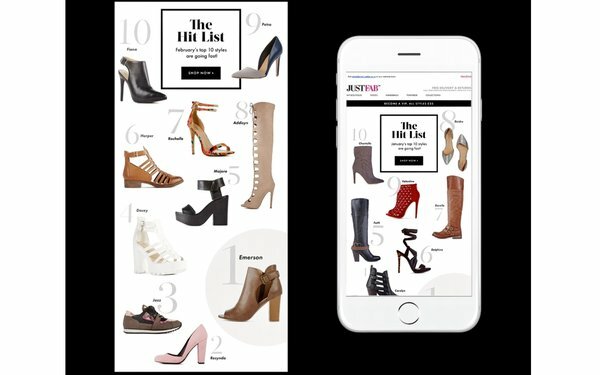 Monica Deretich, vice president of marketing & CRM, JustFab, spoke at MediaPost’s Email Insider Summit in December 2018. We are all about the customer. We bring style true to her personal preferences. Style is personal. That’s what we set out to do and (the challenge) change the way she shops. Our member is the reason why we do anything. They inspire us and we return the favor by inspiring them with great fashion. The goal is to change the way women shop. We have four pillars Today we’ll focus on personalized styling. The others are inspiring members, giving her value for price, and building community. Personalization is now a staple. Personalization is a journey, not an overnight achievement. You must walk before you run. At the site, you are greeted with a style quiz. Visitors provide name, shoe size, location, and style preferences. So we have really rich data to best serve her through personalization. We also capture what she’s browsing, her page views, her purchases, her cart, what she’s searching, what she’s adding to her wish list. We then match her with a profile and give her personlized monthly boutiques. She has access to pairing across all of our style personals. We show her what she wants to see. It helps to make the onsite and email experience personalized through recommendations. If someone is a plus size member, she will see plus size models on the shopping grid. Crawling: When I joined JustFab, our emails were being coded in the Philippines. This crawl is what we could do once we had first name, membership type. When we defined batch and blast and created basic email segmentation, we saw 9% lift in click through. When we added first name and subject line, we saw a 35% lift in open rate. Then we tested personalized send time and that gave us a 42% lift in conversion rate. With a test in geo-location personalization, we used product recommendations, more of a segmentation play, we saw a 21% build in RPM by doing so. Our personalized email send time test saw a 42% lift in purchase. The test saw only a 5% lift in open rate but by targeting users when they are most likely to open email, the intent to purchase is significantly greater. It’s important to look at all the metrics. We were finally able to give her 1:1 product recommendations. Once we were able to personalize the email, we saw a 44% increase in first-time purchases. It was an massive win for us, just by showing her the right product in the email and getting her to the site. Once we implemented purchase-funnel marketing such as abandoned cart, browsing abandoned, you have a credit to spend, we increased our customer LTV by $2, which is massive. When you do personalized recommendations, the template’s going to look a little different. We felt pretty confident rolling this out to our members. It also eliminated a lot of work for our teams, having to not worry about coding or designing. It’s had a great impact on our work efficiency. We have been able to implement targeted offers based on her shopping behaviors. We have seen up to 136% incremental revenue per customer as a result of these targeted, personalized offers. Customer journey experiences ... we’ve been able to decrease our churn by 16%. Once she’s made her purchase, we have our welcome series flow but how do we onboard her, how do we educate her on the VIP membership program? Showing her models closest to her body size resulted in a 9% lift in conversion rate. UGC has worked in email as well. We’re not flying, we’re speed-walking/running. So much more to do in personalization. Recently, we implemented browser notifications, which are personalization. Our abandoned cart campaign is live. We also feed many of those data points into our browser notifications to create relevant messages. Not as frequent as emails. That’s over-saturation. But they’re very effective. We are working on developing a mobile app, which will have a lot of those personalization tactics and, hopefully, more to get us to that North Star of personalization, which is having that 1:1 conversation with our members. 1. The best personalization is not always apparent to the customer. 2. Building the foundation by collecting data from your customer is key. 3. Commit to many testing iterations. 4. Partner with your vendors on strategies. 5. Share learning across other departments to maximize personalization tactics in as many channels as possible.